Are you researching how to provide your baby with the best sleep possible? Many new parents choose a bassinet. They are more convenient, allowing your baby to sleep next to you but in their own separate comfortable little area. When it comes to choosing the perfect bassinet, it is not an easy task to do. There are so many choices on the market today and the price varies depending on the features you desire. Choosing one that has mesh sides is a good way to go, as the mesh sides allow you to keep an eye on your baby and effectively increase airflow in and out of the bassinet. It is made of completely breathable material. Here is our list of the Top 3 best bassinets with mesh sides to help you choose the right one for your baby. Simply put, this is Halo’s new model bassinet. It is for many moms who prefer to keep their baby next to them at all times without bed sharing. The Halo Bassinest Swivel Sleeper creates a comfortable and separate sleeping area for the baby. An ideal bassinet option for all moms especially ones who have had a C-section. The Halo Bassinest Swivel Sleeper is designed with baby’s comfort in mind giving the baby its own space to sleep comfortably. The bassinet can adjust in height of 24” to 34” inches tall and needs only 32” inches for wall clearance. The Halo bassinet also can rotate 360 degrees. It measures 43" L x 43" W x 34" H and is made out of aluminum, steel and high-impact plastic making it roomy and durable. The Halo Bassinest Swivel Sleeper bassinet has mesh-side profile walls and it folds down easily which makes it easy to access your baby for feedings or diaper changes. The mesh walls also lock into place when needed. Easy viewing makes this bassinet the ultimate option in convenience and safety. Included with the Halo bassinet is a volume control module of three lullabies, three soothing sounds, two levels of vibration and night light. It also has a thirty-minute thirty auto-shut off and Back to Bed reminder for mom/dad. Two large pockets included for easy access to baby essentials. The bassinet can be wiped clean with a damp cloth is a bonus for easy clean up. The bassinet sheet is also machine washable. The manufacturer recommends using the Luna bassinet up until five months old or until your infant starts showing signs of rolling over, pushing up to a kneeling position or pulling up. Weight capacity of 20 lbs. The Halo Bassinest Swivel Sleeper Premiere Series Bassinet is great option for parents who want the convenience of keeping their baby by their side. If you’re looking for the best travel bassinet with mesh sides, this is a great option. It has a four-point Safe-T locking system and an updated design of all mesh breathable sides. As the name suggests, this bassinet is meant for parents who enjoy traveling and want to bring their little one on all the adventurous trips. 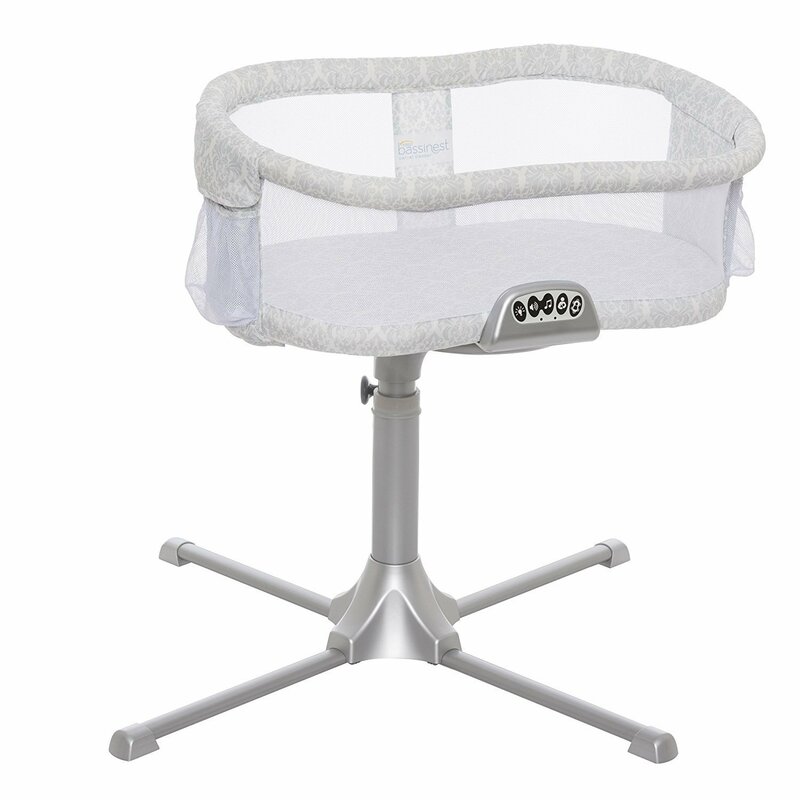 The Fold N' Go bassinet is extremely slim and lightweight, so it can fold flat rather easily. Once it’s folded, it has a carrying handle so it’s really portable. You can put it virtually anywhere in your car. The firm base consists of a mattress which is very comfortable and comes with a machine-washable sheet. The sides are nearly all mesh, so they provide excellent breathability for your little one. There is a safety system too to keep your baby from harm. The safety locks keep your baby safe and make the folding process easy, with a push a single button. The Brica Fold N' Go travel bassinet is perfect for traveling families. Compact and lightweight makes it a winner. The Green Frog Lily Pod bassinet is compact and cozy cradle that can provides soft rocking motion to calm your little one before going to sleep. It has a durable low height frame and is modern in style. All sides are made of fabric and have breathable mesh side windows. The Green Frog bassinet is a beautiful cradle with great construction and quality stitching. The feet are heavy duty and the rocking motion is sure to gently make your baby sleepy. While the design seems basic, there are two different color options to choose from, which are Grey and Sand. One of the best bassinets with mesh sides, the Lily Pod can easily be moved around and transported using is sturdy and smooth concealed wheels. It is also fairly light for its size. The mesh windows on both sides of the bassinet and low profile make viewing your baby easy. You will definitely be able to keep an eye on your little one through these large round mesh openings which also ensure optimal airflow. Included inside is a premium-grade mattress covered in a cotton sheet which is machine washable. It has easy assembly and comes with a carrying bag. The Lily Pod bassinet is a great option for babies up to six months of age and weight capacity to 18 pounds. So modern and chic. 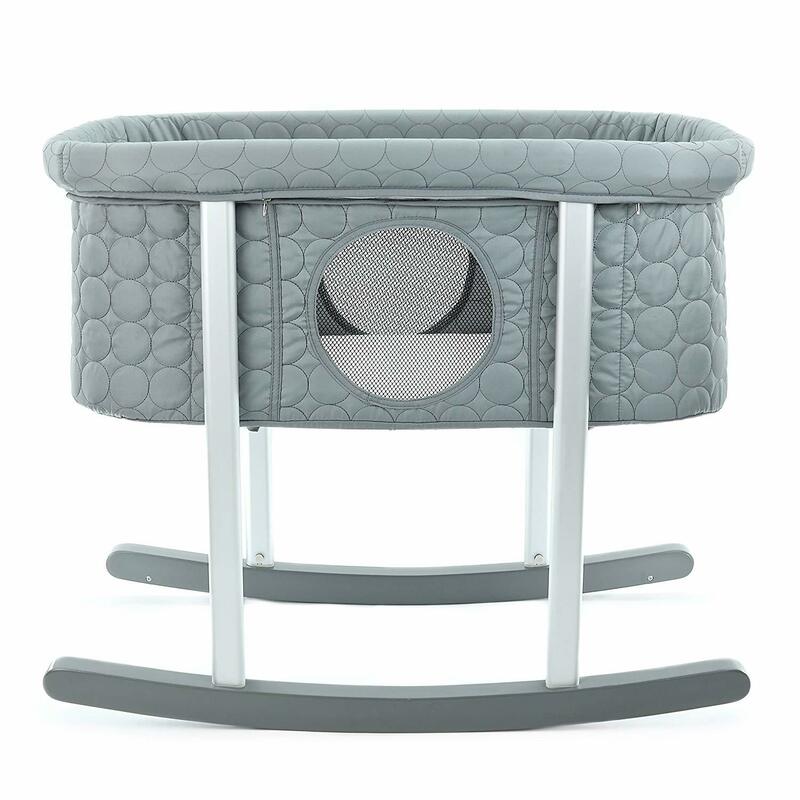 The best bassinet with mesh sides is out there for your precious little one. There are many options on the market with various features but we think the Halo Bassinest Swivel Sleeper Premiere Series Bassinet is the best with mesh sides because it offers comfort, stability and has cleverly designed the traditional bassinet into a practical modern compact one. 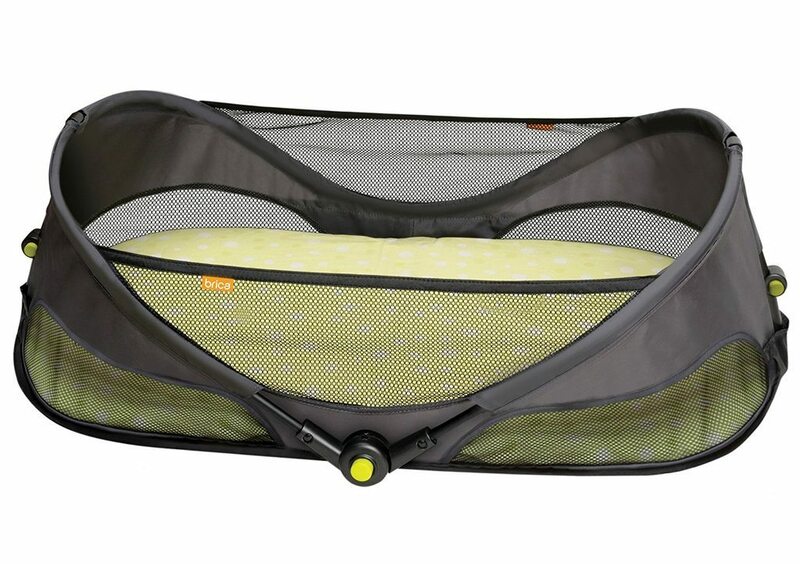 We also recommend the Brica Fold N’ Go bassinet for those of you who need a travel bassinet with mesh sides and not a traditional bassinet for your home. These two bassinets are winners in our book.